Bringing together viewpoints of leading scientists and engineers, this new series provides systematic coverage of new and emerging topics in metamaterials. 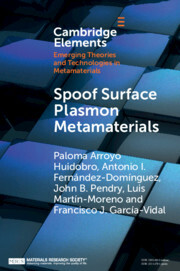 Elements cover the theory, characterisation, design and fabrication of metamaterials in areas such as electromagnetics and optics, plasmonics, acoustics and thermal science, nanoelectronics, and nanophotonics, and also showcase the very latest experimental techniques and applications. Presenting cutting-edge research and novel results in a timely, in-depth and yet digestible way, this series is perfect for graduate students, researchers, and professionals with a background in physics and electrical engineering who are working on metamaterials. This series is co-published in collaboration with the Materials Research Society.